There was once a Community Corrections agency that took great pride in the way its staff, particularly managers, were able to follow and adopt the latest scientific research. One interesting aspect of this research was labeled Evidence-based Practice (EBP). The prevailing understanding was that if EBP’s could be implemented with what some referred to as ‘fidelity’ all would be well in the shire. If a given EBP could be associated with reductions in repeat offense, or linked problem behaviors, it was theorized that it could be implemented again in accordance with research, at another agency – let’s call our example agency APT County Community Corrections — with similar success. So APT went about implementing several different EBPs simultaneously: Motivational Interviewing, Cognitive Skills Building, and Offender Assessment utilizing 3rd and 4th generation tools. Their strategy was simple: to expose the maximum number of line officers to training in these practices. If the training didn’t stick, they would arrange for a booster training. Should the booster not have the desired effect, the fallback was other quality improvement mechanisms heavily laden with feedback, pressure, and incentivization. “APT” has adjusted its implementation strategy many times and it has long since replaced the ‘train and pray’ with staff development models that consistently provide skill cultivation, as well as practice opportunities (a key piece of the ongoing process, rather than a mere event). Still, somehow, something seems to be awry; a majority of staff haven’t fully integrated the use of EBPs, and opportunities for blending skills are so often missed as to be the norm, rather than the exception to the rule. When staff ‘qualified’ as showing competency with particular EBPs, they preferred not to be monitored or to receive feedback on said practices after their initial assessments. In addition to the “seeds” APT county used, they are now forced to consider how they went about sowing them. What key ingredient was missing? The story for our fabled agency gets re-contextualized when APT begins to recognize that there are more complete criteria than “seat-of-the-pants/ad hoc” selection for initiating implementation of an EBP – there’s science and research. Although it takes some time, APT begins to learn the “how” of EBP system implementation is the critical difference, particularly at the start of the learning/implementation cycle. Unless they go about providing their staff new skills rather carefully, they can end up throwing away a lot of good money and time. Even when staff is able to demonstrate the desired skillsets, said skillsets aren’t necessarily integrated in ways that are practical, efficient, or prone to produce the desired outcomes. According to the Parable, the piece that APT County overlooked is that every context in which they introduce new skills or interventions needs to be established and enabled to carry out necessary adjustment after training: at process, technology, human, and cultural levels. No matter how choice the seeds or how well sown, if the soil is not adequately prepped by Enabling Context, the results can amount to nil. 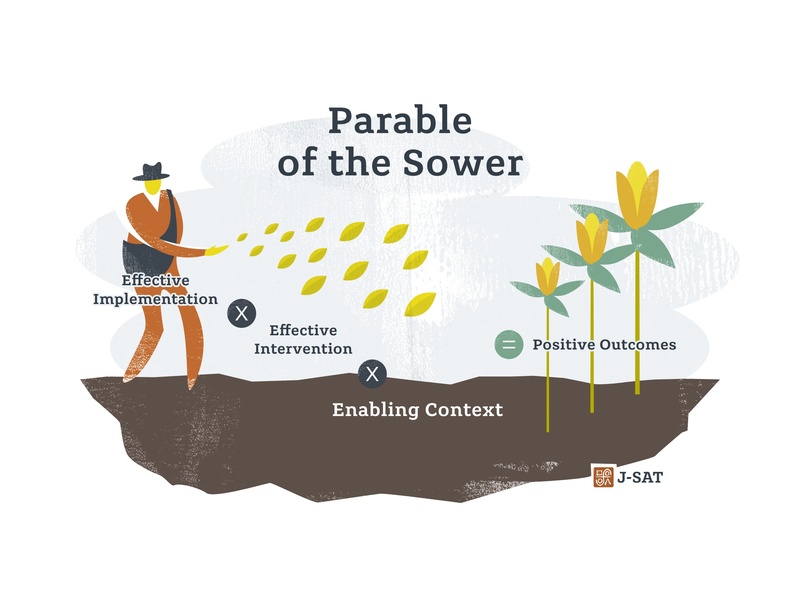 Enabling contexts is the hard work that focuses people’s’ attention on not only the select intervention, but also on how the intervention will apply to each individual’s context. No email blasts, posters, or webinars will suffice for this. Helping folks focus not just on the abstract definitions, but on how new practices will affect their current work process, can be very personal and emotional– and as such meets the criteria for adaptive change work. The greater number of differing contexts (e.g., pre-trial, general supervision, ISP supervision, residential, etc.) are involved in an implementation initiative, the more complicated enabling those context(s) becomes, and the more critically necessary is engaged facilitative administrative support. After much perseverating, APT County committed to getting some outside consultation in the form of coaching and ‘schooling’ in how to work with the adaptive change issues of individual staff as well as those of the larger organizational culture. Clarity began to dawn around the notion that all three components (i.e., Effective Practices, Effective Implementation, and Enabling Contexts) must be aligned as a multiplicative model to drive better outcomes. APT County staff learned to ‘read rooms’ and engage dialogues rather than continue circular debates. They discovered the value that ongoing coaching held for all staff as adult learners in unpredictable and highly evolutionary times. Flattening hierarchies and showing more deference to line-level expertise was yet another tactic that, little by little, helped APT increase agility to implement innovation, from the level of the general down to the very specific. Initially unanticipated, multiplier effects began to show up: greater staff retention, higher morale, and increased capacity to provide and receive honest feedback. Fewer staff felt beholden to their “second jobs”, a.k.a. passively existing inside norms that support work-avoidance. As a result of attention to the Seeds, the Sowing AND the Soil, APT County saw positive client outcomes tick upwards, first anecdotally and then in hard data. In short, all within the shire was once again well.